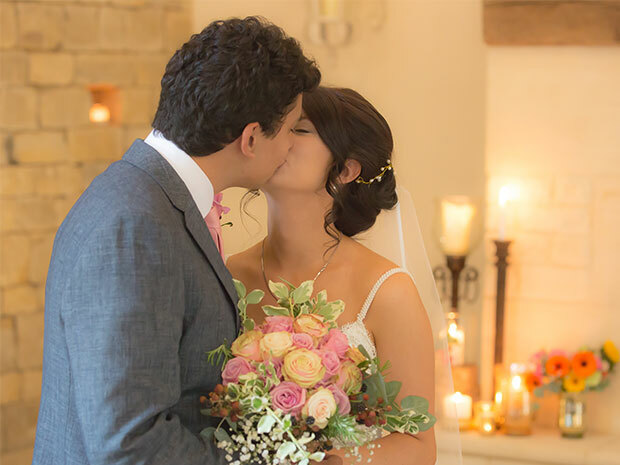 Bringing their dream day to life with fantastic floral décor, sentimental family touches and Ecuadorian elements, Alice and Jose tied the knot within the beautiful setting of 16th-century Cotswold barn, Blackwell Grange. 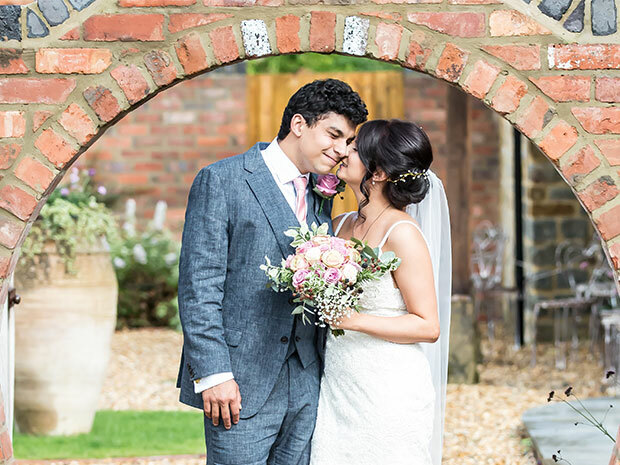 Be inspired by the beautiful wedding at Blackwell Grange. Great food and a relaxed atmosphere. Why did you choose your venue? And what did you love about it? We took a real leap of faith as our venue was nothing but sketches when we committed to it and was mostly built the following year. We loved that it was deep within the Cotswold countryside, surrounded by rolling green hills and very much isolated. The 16th-century thatched barn was a real pull as it provided historical placement as well as a beautiful setting, and the floor-to-ceiling windows in the modern reception venue combined with the natural slate materials and repurposed decorations filled the rooms with light and comfort. What was the theme or colours of your day? We combined quite natural colour combinations such as peaches, light pinks and greys with an array of different types of flowers, shades of pinks in old English roses for the bridal party flowers and a number of bold and bright flowers decorating throughout to suit our personalities. We coupled these with very natural greenery such as ivy, eucalyptus and blackberries pulled from the hedgerow that morning! 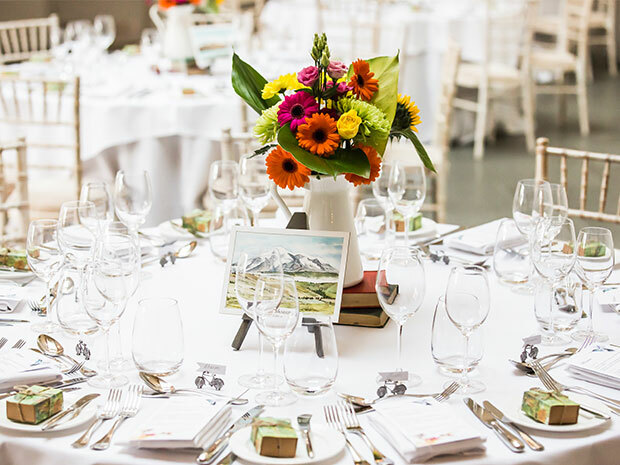 We wanted a relaxed, almost bohemian feel to the wedding to reflect our personalities whilst still incorporating local seasonal produce and the Latin American culture of the groom, placing a number of Ecuadorian elements throughout the wedding. What decorations did you have? Did you make any of them yourself? For the ceremony we filled the room with low lights, candles and individual jars or brightly coloured flowers; sunflowers, roses and gerberas, rose petals as confetti in manuscript paper cones, and sprigs of gypsophila to complement the natural and earthy feel of the barn. For the reception we incorporated more brightly coloured flowers matched with herbs such as rosemary and lavender and presented in old fashioned milk jugs. These were surrounded by succulents potted in assorted teacups and Ecuadorian scarves of an array of colours. 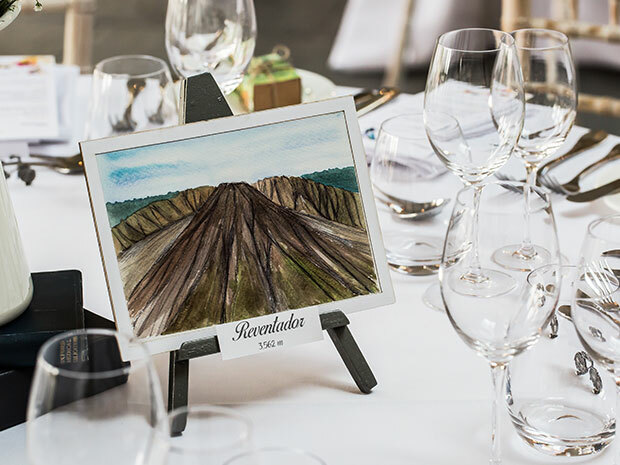 Additional Ecuadorian touches were made in the table numbers, each a hand painted image of one of the many volcanoes surrounding the groom’s place of birth, as well as watercolours of humming birds on the menus, and gift boxes made out of world maps containing Ecuadorian chocolate. It was very important for us to be respectful of our family who had all helped us be there and to be able to honour them on the day, therefore we included both our parents wedding photos and all four sets of grandparents wedding photos so that those unable to be with us still held a presence on the day. What colours did you choose, and why? We used shades of pinks and creams alongside natural slate greys for the wedding party, complementing the ivory gown of the bride and incorporating florals in sympathy with the natural surroundings. Bold and bright colours mixed with softer greens were used throughout the ceremony and reception as well as accents of gold over black, white and greys to bring out the depth. Did you use flowers to decorate? 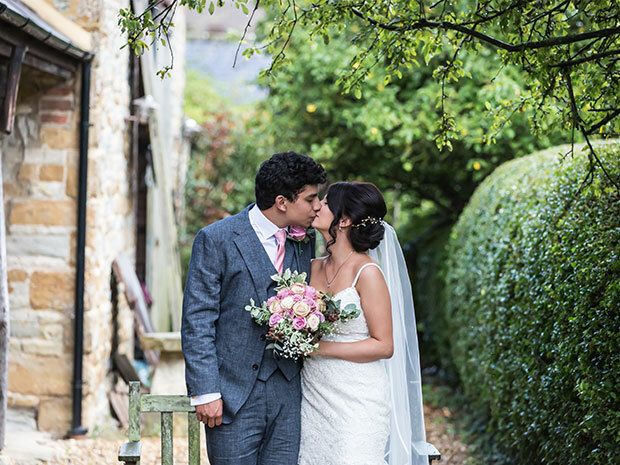 The wedding party’s flowers were made of old English roses, eucalyptus, rosemary, ivy, gypsophila and fresh blackberries pulled from the hedgerow that morning. We also had flowers throughout the ceremony in every alcove and surrounding the copper fireplace, on and around the cake, throughout the reception room and on every table. We had an assortment of in-season flowers including sunflowers, roses, gerbera, gypsophila as well as herbs such as lavender and rosemary and greenery such as eucalyptus and ivy. Succulents were placed throughout the courtyard and topiaries and olive trees were accented with soft white lights. We wanted to maintain a very relaxed and intimate atmosphere as our guests were mainly family and it was the first time many of our family members were meeting each other in person, being based on two opposite sides of the world. We introduced a ceilidh in the evening to breech the language barrier and including culturally British music in contrast to the Ecuadorian traditional music we had played throughout the reception. This maintained a lively but still relaxed atmosphere and allowed people of all ages and cultures to join together. Tell us about your dress – who was it by? Why do you love it? How did you find it? My dress was ‘Elise’ by Wtoo and consisted of a beautiful head to toe scalloped lace in ivory, accented by tiny glass beads to catch the light. I loved the lace pattern that was quite unusual and vaguely reminiscent of the glamour of the twenties whilst the sheath style allowed it to be very natural and flowing. I found it eventually at Tilly Trotters in Leamington Spa Town, the very first place I looked and the place I ultimately came back to after being unable to forget it wherever else I looked. What jewellery/accessories and shoes did you wear? Who designed them? I wore a single solitaire diamond necklace gifted by my grandfather as a family heirloom, coupled with Ecuadorian pearl earrings matching the straps of my dress. My shoes were a soft pink heel by L. K. Bennet whilst my veil, again bought through Tilly Trotters, was a fine lace with a silk trim falling just below my back so as to remain modest without distracting from the dress. What did the groom wear and who was it by? The groom (and party) wore a tried and true three-piece suit from Marks and Spencer in slate grey! This was coupled with a soft pink silk tie for the groom and floral pink ties for the party to align with the bridesmaids. The Groom also had personalized socks with his name and the date of the wedding as a little bit of fun, gifted by the bride. Where did you get ready before tying the knot? I, the bridesmaids and Mother of the Bride all got ready in the ‘Potting Shed’, an incredibly chic and elegant room swathed in soft lighting, velvet and mirrors, matched with natural stone and wood. 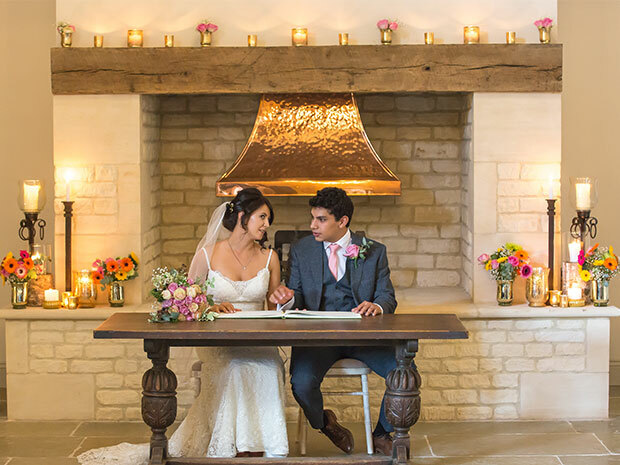 Our ceremony was held in a 16th-century thatched barn in the grounds of the venue, built entirely with original stone with slate flooring and natural bare wooden chairs, with a focal fireplace instead of an altar. The mothers of both the bride and groom both performed a reading during the ceremony. The mother of the bride read ‘He’s not perfect, you aren’t either’ by Bob Marley, whilst the mother of the groom read Victor Hugo’s ‘When two hearts meet’ in Spanish, translated into English by his sister. If you had a drinks reception, where was it held? What drinks/canapes were served? The drinks reception was held in the bar and viewing gallery of the modern glass barn, consisting of a large copper bar and lots of plush velvet sofas and table lamps. Signature cocktails were served including a strawberry rose sangria as well as an elderflower spritzer. The canapés included a spiced calamari and chorizo with saffron and garlic aioli; and a warm ricotta and spinach tartlet with toasted pine nuts. Our first dance was ‘Como Fue (How was it? )’, sung by Ibrahim Ferrer and although not choreographed was danced in a loose bolero style. The starter was a salad of crispy duck, followed by pork tenderloin with a ravioli of spiced pork belly and dauphinoise potatoes. To finish was a trio of desserts including Eton mess, a triple chocolate brownie, and passionfruit cheesecake. Was there a stand-out dish for you? What was it and why? The spiced pork belly ravioli was delicious! However, the stand-out food of the entire day was the wedding cake, a three-tiered naked cake consisting of a layer of lemon and blueberry, one of white chocolate and raspberry, and one of salted caramel, stem ginger and pecan. Did you have evening food? What was it? In the evening along with the cake we had stone-baked pizzas, cooked outside by the chefs in the herb garden with a choice of toppings. This was all accompanied by an old-fashioned popcorn machine! 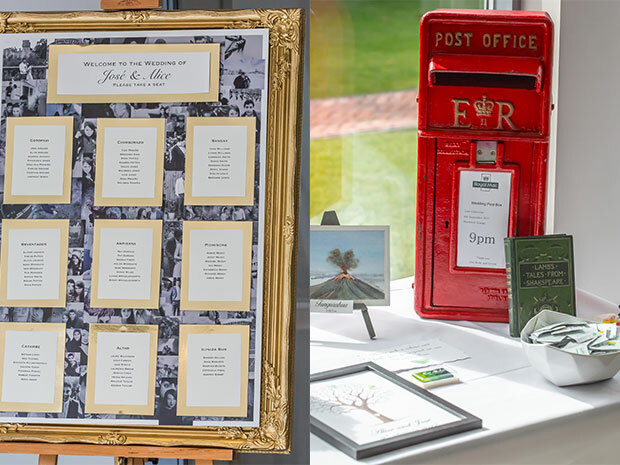 How did you feel the events team helped you in the lead up to on the day of your wedding? Naturally saying the ‘I dos’ and marrying my best friend! Nothing could be better than that although the entire concept of bringing our family together in an intimate settling to eat and dance was amazing and we thoroughly enjoyed the full day. The day was a huge mixture in terms of weather – one moment sunny and the next stormy! As the bride walked down the aisle thunder and lightning was crashing around the venue, creating a very atmospheric moment and giving way to glorious sunshine for the photos. What advice/tips would you give to brides-to-be still planning their big day? Relax and enjoy your day, it’s a once in a lifetime moment and one of the only times you’ll have the opportunity to be surrounded by those you love the most all enjoying themselves. Additionally, trust your instincts in terms of vendors, if something doesn’t seem right then it probably isn’t and it’s better to catch it early than on the day itself. I believe that everything happens for a reason, if something went wrong then someone came in to make it better than it was already planned to be. Our day might not have been for everyone but it was perfect for us. Did you go on honeymoon? If so, where did you go? Our whole wedding was one huge whirlwind with many major events happening at once, one of which was starting a new job only days after the wedding and so we haven’t yet been on our honeymoon, instead we’ll be taking it on our first wedding anniversary as a nice way to celebrate and reminisce. We’re planning on travelling around a few countries in Europe, going to our favourite spots and hopefully finding new ones! 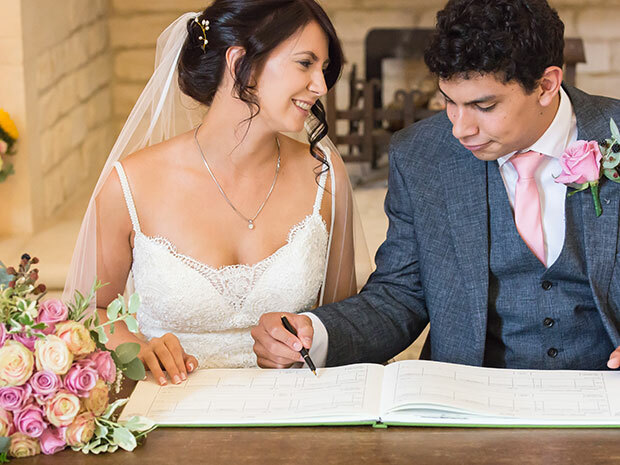 If Alice and Jose’s wedding has inspired you, see Blackwell Grange, call (01608) 698798, email weddings@blackwellgrange.co.uk, or visit blackwellgrange.co.uk directly.